January 2, 2009 – Some Colorado residents spent the New Year making repairs and calling their insurance companies after strong winds pounded the Front Range, Colorado Springs, the Eastern Plains and Southern Wyoming early Tuesday. The Rocky Mountain Insurance Information Association estimates the damage from the windstorm at approximately $7 million from the 2,500 homeowner and car insurance claims filed so far. While there was some major damage reported, most of the claims appear to be from more minor losses to roofs, fences and vehicles. “The higher price tag of this week's storm is due to the widespread damage resulting in a large number of smaller claims,” says Carole Walker, executive director of the Rocky Mountain Insurance Information Association. 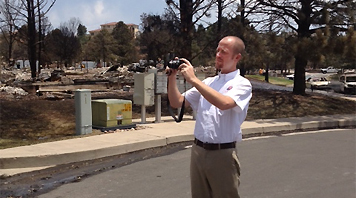 “Colorado windstorms don't typically cause expensive insured damage. That's why homeowners should weigh whether minor maintenance damage to a few shingles or a fence even meets their out-of-pocket deductible.” However, homeowners who need to file claims should make temporary repairs and call their insurance company as soon as possible to prevent further damage. $20 million in insured damage occurred along the Front Range on April 8-10, 1999. $20 million in insured damage occurred in Boulder County on Jan. 17, 1982. $10 million in insured damage occurred along the Front Range on Jan. 28-29, 1987. $7 million in insured damage occurred along the Front Range, Colorado Springs, Eastern Plains on December 30, 2008. $5.2 million in insured damage occurred along the Front Range on Oct. 29, 1996. $3 million in insured damage occurred along the Front Range on Feb. 2-3, 1999.